Hands up if you overindulged over Christmas and New Year? Let me tell you that you’re not alone. If I had £1 for every ‘hungover’ or ‘absolutely stuff’ tweet that has appeared on my timeline over the last few weeks then I’d be a millionaire. I didn’t overindulge this Christmas as much as I used to as over the last few years when it comes to eating and drinking as I’ve really become so aware of what I’m eating and I haven’t drank alcohol in the longest time but its definitely something I’ve done a lot of in the past so I know how awful it can make you feel. Also now when I do overindulge, I really feel the effects because I’m not as used to it. However one of the things that I did overindulge in was the late nights and being tired really has a negative impact on my mood and skin- when I’m tired, it shows! There’s so many different products out there that claim to work wonders in making you feel better when you’re hungover, tired, too full or weather beaten but few are actually successful. I generally find that herbal remedies are the best because you’re not putting things that are totally manufactured and full of chemicals into your body and whilst they aren’t miracle cures, they will be doing your body some good. I wanted to share with you some of the products that will help you to get over the festive season and to kick start your 2014 into something great. One thing that I do abuse throughout the festive season is my sleep. I have a poor sleep pattern to begin with but over Christmas and New Year, it goes completely out of the window. Feeling tired is one of the worst feelings for me as it really effects my mood and my ability to blog, work and complete university work. 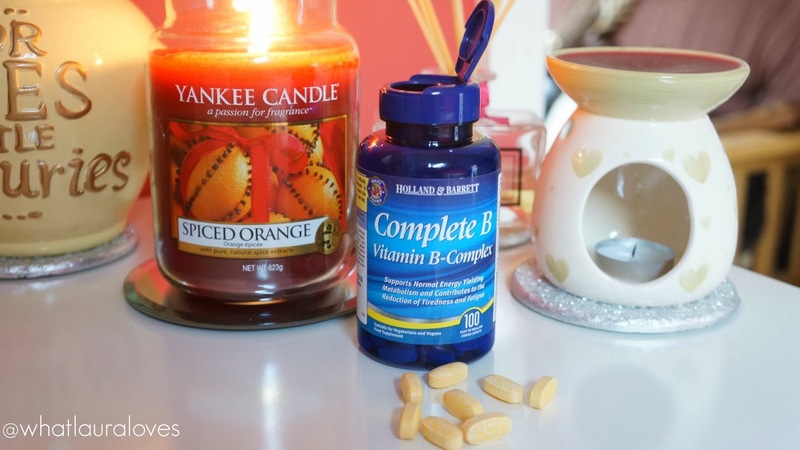 Sometimes I’m just in need of a pick me up and for that, the Holland and Barrett Complete B Vitamin B Complex does the job. B vitamins help to support the nervous and immune systems, they enhance the effectiveness of white blood cells which fight bacteria and viruses which in turn, help to keep you feeling energised and healthy which is definitely what you need after all of that Christmas shopping, cooking and partying. I have been taking two of these capsules daily and whilst the results aren’t instant as soon as you take the first ones, you do start to notice a difference in your energy levels after a few days. I find the capsules are quite hard to swallow and they absolutely stink but being healthy isn’t always going to be glamorous, so I persevered with them and I’m pleased I did as I’m used to taking them now. You can order your own tub of B Vitamins here. 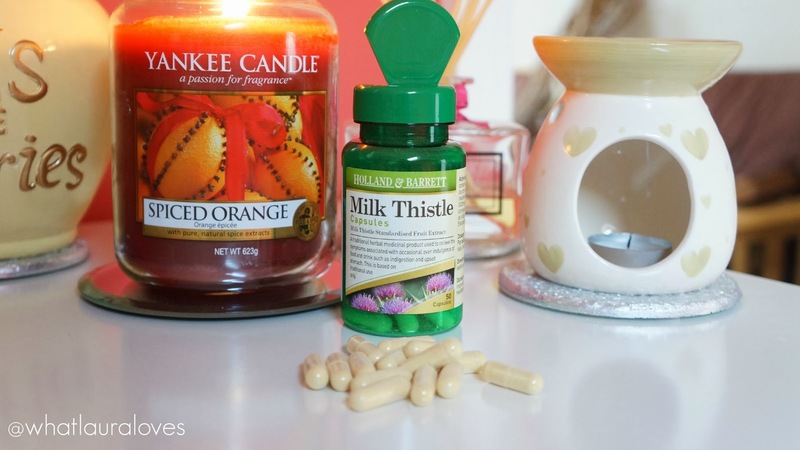 Another capsule I’ve been popping after my green juice each morning is Milk Thistle. This is super good for if you have a hangover as Milk Thistle is known to fortify the liver which is the organ that processes and detoxifies anything that might be damaging to the body, alcohol included. However I have been taking Milk Thistle on and off for a number of years to help my psoriasis. I only have a small patch of psoriasis on my wrist now as my elbows cleared up when I first started losing weight a couple of years ago and so far they have remained clear. Milk Thistle is good for psoriasis sufferers because it can inhibit human T-cell activation which occurs in psoriasis. It isn’t a proven fact but some skin problems occur as a result of poor liver function which taking Milk Thistle can help and if you have psoriasis like me then you’ll generally give anything a go to keep it calm! Mine are from Holland and Barrett and are the 50 capsule pot. 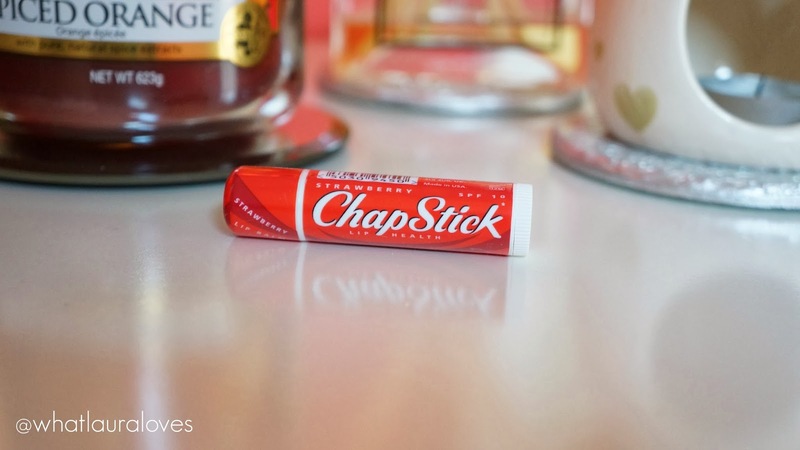 When your lips are feeling chapped and dried out with the cold winter weather, I’d suggest slicking on some Chapstick to soften them up. My favourites are the Strawberry and Apple flavours as they smell and taste good if you catch your lips with your tongue, oh all right, if you lick your lips, and they do a good job at softening and nourishing the lips as well as soothing them if you have any cracks. They have an SPF in them too so if you’re out on the slopes this winter then I’d suggest applying some before you head out onto the snow. For information on all of the Chapstick varieties, check out their website and to buy, I’d suggest heading over to Boots; purely because I have AMAZING service from them over the phone today AND you get those all important Advantage Card Points with each purchase. 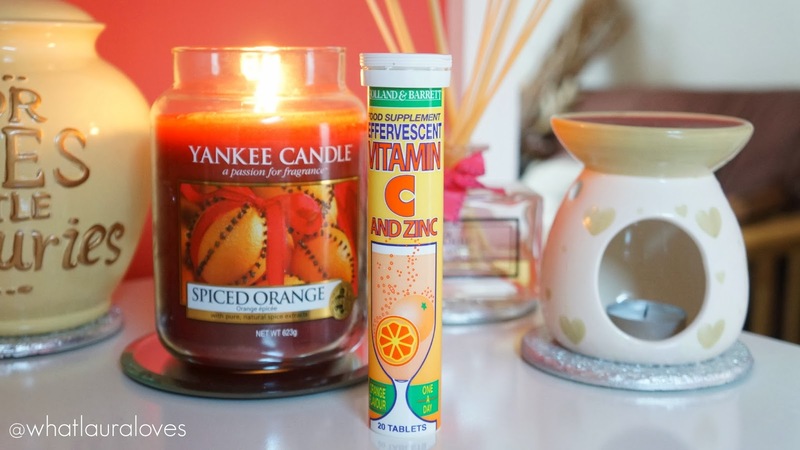 When I’ve got a cold there is only one vitamin that I turn to and that’s Vitamin C. Drinking a small glass of water with an effervescent vitamin C tablet dissolved into it can work absolute wonders as they enable the fast absorption of vitamin c into the blood stream to quickly top up your immunity. Taking vitamin C when you have a cold helps to lessen the symptoms you’re feeling and shorted the duration time of the common cold which is great for when you have a cold that just wont go away! They’re also great for taking daily to keep your vitamin c levels topped up, thus helping to prevent a cold. These ones are the Holland and Barrett Effervescent Vitamin C and Zinc tablets and they’re £2.75 for a 20 tablet tube, available here. They have the added benefit of containing zinc too which, together with vitamin c, helps the immune system to function normally and helps to protect the body’s cells from oxidative stress. You might recognise the brand name Berocca, well these are very similar, just Holland and Barrett’s own brand and they’re much cheaper than Berocca. You could also read my post on how to avoid getting a cold during the winter to help you from catching a cold next time. 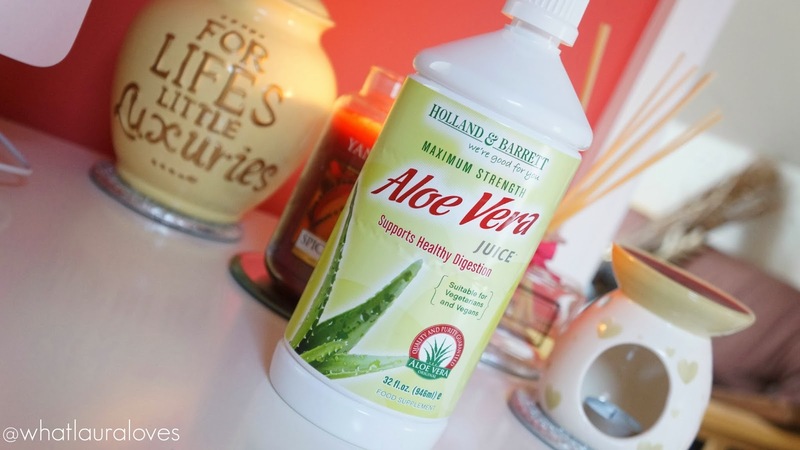 Drinking Aloe Vera Juice has to be one of the most healthy things you can add to your daily routine. Whether you take a spoonful direct, mix it with water or a green juice like I do and whether you take it once or three times per day, the benefits are supposed to be amazing as it is enriched with countless vitamins, minerals, amino acids and fatty acids. It helps with inflammation of the oesophagus and gut which can help to sooth an irritated stomach, it works as a detoxifier to rid your body of toxins, it boosts the immune system, is great for the skin and can help you to lose weight as it improves the digestive system. I’ve only recently added this to my routine and can’t wait to feel the benefits long term. I have it twice per day, once in the morning and once at night with the green juice that I make. If you’d like me to do a recipe post on it then do let me know. The Aloe Vera Juice that I am using is available here. Furry. Yes you read correctly. When you’ve overindulged on mince pies, turkey gravy and stuffing, your teeth can feel unclean and a little furry. Cleaning your teeth is the absolute basic and essential hygiene step you can take. 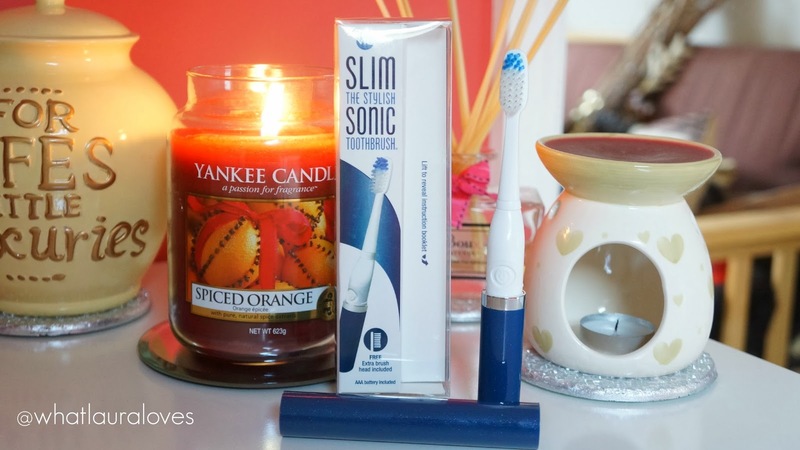 The toothbrush I’m using right now to keep my teeth sparkling clean is the Slim Sonic Portable Toothbrush. It is stylish as it comes in lots of different colours and patterns, travel friendly as it is in its own case and good for your teeth as it vibrates to deliver 22000 brushstrokes per minute to keep your teeth pearly white and clean over the season of sweet, savoury and indulgence. If you have always wanted an electric toothbrush but haven’t wanted to shell out a lot of money for one then I’d recommend adding one of these to your basket here. In the box you also get a spare brush head and a battery to use with it making it great value for money! 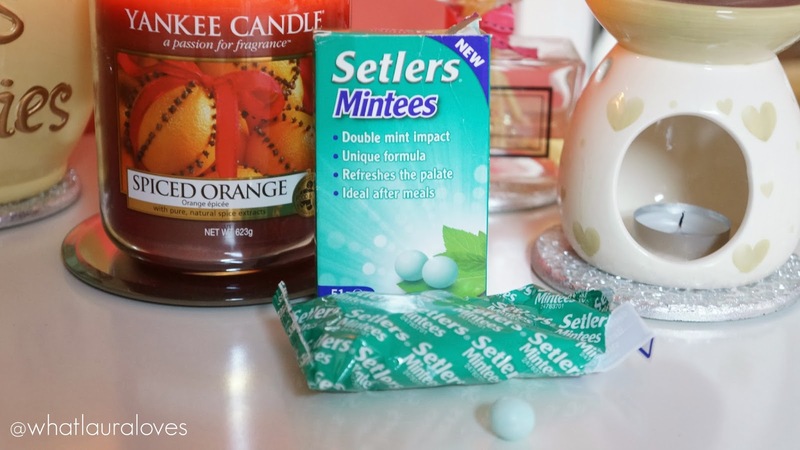 Forget After Eight Mints, when you’re out for a meal keep a pack of Setlers Mintees in your clutch for when you’re finished eating. They’re a unique double impact mint that are designed to soothe the too full feeling that you can get after eating a meal, particularly over Christmas when overindulgence is pretty much the norm. They have an innovative formula and are made up of three layers- spearmint, peppermint oil and a soft, crumbly centre which taste great, freshen your breath, cleanse your palate and help to avoid discomfort after you’ve eaten. You can get these from most supermarkets and pharmacies, or you can buy online here. For more information on Setlers Mintees, you can check out their website here. Too many late nights over Christmas can lead to bags the size of a Primark spending spree under your eyes. One way to help to reduce the dark circles and puffiness under your eyes is to pop on a pair of the Klorane Cornflower Eye Patches. They’re gel patches that you apply to your lower eye contour area (try not to do this when the postman is due as I did when I first tested these out… oh the shame) and leave them on for twenty minutes before peeling them off. They instantly feel cooling and you really do feel the effects of them- they make my eyes look much more awake and definitely reduce the puffiness. Once you’ve removed them you just tap the eye area a little with your ring finger. 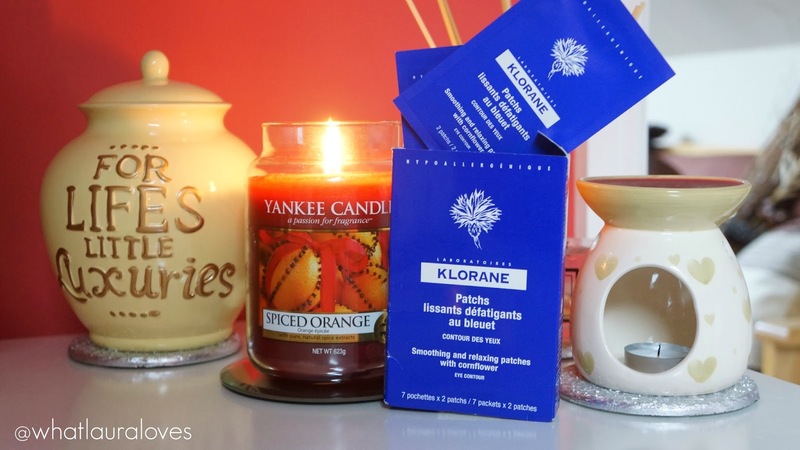 I’ve used French pharmacy brand Klorane for years so I can really vouch for them as a brand and recommend them. I find that these eye patches feel really cooling as they are but if you put them in the fridge and leave them over night, then they work much more quickly in the morning which is great, especially if you’re in a rush as you can reduce their treatment time from twenty minutes down to ten max. These are available from Escentual and they’ve got a sale on them right now… go go go! Oh and while you’re there, I would REALLY recommend their eye makeup remover (review here) and their dry shampoo (review here). 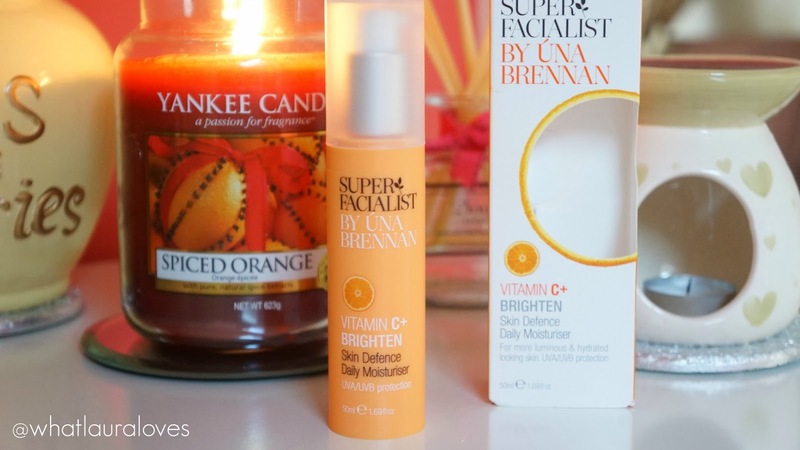 When you’re having a dull skin day, perhaps after a party or a late night, the the Una Brennan Super Facialist Vitamin C Skin Defence Daily Moisturiser is a fabulous cream to apply after you’ve cleansed as it gives your skin a healthy looking glow. Whilst it does give your skin an instant glow, the more you use it the more your skin looks luminous and youthful… don’t get me wrong, it’s not going to turn back the clock to when you were ten years old without a care in the world, but it does make your skin glow! As well as super brightening Vitamin C, it contains moisture binding Hyaluronic Acid which is great for skin that looks dehydrated with fine lines as it plumps up the skin and it also contains Ferulic Acid which is rich in anti oxidants. 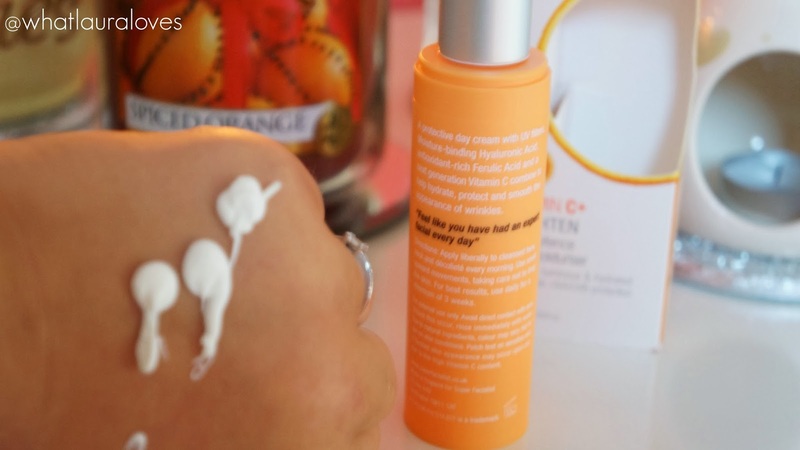 I love the scent of this cream as it smells of oranges but not in an artificial way. It smells delicious, making it a joy to apply, especially on a cold winters morning. I have oily skin and this works well for me for me but I think it would be good for dry skin types too. You can pick up your own here… oh and its on sale RIGHT NOW! Shhh… go forth and buy lovelies!